$42.99 & FREE Shipping on orders over $59. Had good success in the past - Great beer! I really enjoy citrusy hop profiles - can't wait to try it! If brewed correctly, it's one of the cleaner finishing beers that Morebeer offers. Excellent session beer. My husband enjoys this kit the most. No the kit does not come with yeast. As I recall when you place the item in your basket the system makes sugestions and one of them is the right yeast for the job. Which I also bought. It was a great Brew! MoreBeer kits do not typically come with yeast. They usually suggest a yeast when you add the kit to your shopping cart. I used WLP001, California Ale Yeast which cost $7. No this does not come with yeast. I have done this recipe a couple times, once with Safale US-05 and once with "Best of Both Worlds" and both were excellent. Kit does not come with the yeast. You have to order it separately. It is usually listed after ther the kit as things you may want to purchase. No you have to pick out a yeast strain separate. No it does not. Most kits do not include yeast. No, it doesn't come with yeast. Need to purchase some yeast! I added an additional 2oz of galaxy hops during the dry-hop addition - beer tastes great. Definitely one of the favorites I've brewed so far. I don't have any special brewing skills, so I wasn't the reason this turned out so good. It wasn't too bitter. It wasn't too hoppy. It wasn't too sweet. All the flavors were well balanced. The dry hopping did stand out and made this the best pale ale ever. I used WLP051 and followed the directions included with the kit with no deviations. What happened to the PRICE! This is one of my favorite beers to make, but I don't think I'll be buying it again at this price. I bought two extract kits when it was a deal of the day. The brew day was easy and the wort OG was 1.060. Used gigayeast NorCal yeast in 2L starter fermented in basement at 65degrees. Finished at 1.012, kegged and drink after two weeks. This beer has a nice light citra aroma with a big pale ale backbone thanks to the maltodextrin and carapils. Over all a decent pale ale. But the finish is not Pleasant at all. It has been a month since I have first tried it and the finish has become twangy and kinda sticks to your palate. I have had this same taste from other extracts from morebeer but just drank it. I have 10 gallons of this!!!! I don't want to dump it but it is getting worse as it sits in the keg. I would make the all grain if I was to do it again. But the price was right and now I'm left hoping it loses that twang after taste. This was my first recipe kit from MoreBeer, and it did not disappoint. I was looking for one of those "any time" beers, that would be crisp and smooth and taste like summer on the porch. I've shared this with a few friends who have all said they would pay top dollar to buy this at a store or bar, but I don't share it anymore because I keep it for myself. One tip: I called MoreBeer to ask a couple questions since it was my first brew with them, and they suggested a slightly different schedule for dry-hopping than what came with the instructions, and that may well have helped make this such a treat. This kit turned out great. Everyone at the homebrew meeting loved it. Primary for 8 days, secondary for 7. The only thing I want to change next time is to double the dry hop addition. Has a very fruity aroma and taste. Very low bitterness from the Magnum hops, lots of flavor and aroma from the Citra. While it is considered an IPA, the bitterness normally found in most commercial American IPAs is lacking. I really enjoyed the taste. It had an almost sweet finish to it that was very refreshing. This was one of the best of many I have made. I am now using this as my go to brew and I add a little galaxy to the final hop addition and dry hop. If you have not tried it you need to! This is a super easy, but very good beer. I brewed , transferred to secondary and dry hopped, and kegged within 12 days. Few days later after carbonating- it is just great. I'll definitely order this one again. I can brew and drink this over and over again. I've brewed it many times. I've added extra wet hops during the brew, dry hops, etc. It's always amazing. This is my go to beer. I've brewed this three times now. Never lets me down. The aroma is incredible. This one is a crowd pleaser. Highly recommend this kit. excellent flavor, wonderful aroma and mouthfeel. I highly recommend this kit. the Citra hops are a winner. thank you for putting together a great recipe. This kit came out perfect! A very unique citrus profile that hits you in the nose and then plays around on your tongue for a while. One of my absolute favorites... I would compare this taste closer to a beginner level IPA for those looking experiment outside the boundaries of pale ale. Awesome, the best so far! This will be in the top 2 rotation of repeats! Awe Yeah! This is roughly around my 10th batch of home brew. I was a little nervous ordering a brew kit online vs. using the local home brew store. I have to say this is my favorite brew so far. I love the Citra hops and the aroma from the dry hopping is awesome. I did in the primary for 7 days and in the secondary for 10. Fermented with the Wyeast 1056 at 68 degrees then did at 72 for the last 3 days before cold crashing the last day. For those that love a Pale Ale, I promise this will become one of your favorites. I have a feeling it will taste even better in a couple of weeks. Hopefully I will still have some around! I don't brew extract anymore but I love this Citra recipe and it was on a daily deal so what the heck! This was an awesome pale ale with a hop that we love. The grapefruit flavor from the Citra hops is subtle enough not to distract from the malt. A very refreshing pale ale. This is a solid brew, but I would suggest making it a little bit your own. Like most of the beer kits, I adjust them to my liking a little by adding or subtracting. Both the Citra IPA and the Citra Blonde made from this kit were stellar, while the regular Citra Pale was definitely good too. This is by far, IMHO, the best recipe that MoreBeer has. This is one of my favorite recipes of all time. Thanks for another great product MoreBeer. This was my first dry-hopped beer and it was great. A real crowd-pleaser as it has great aroma but not hop-stoopid bitterness. Very well balanced. I was skeptical of the dry yeast, but it worked out great as well. I knew this was going to be a great smellin beer when I laid out the ingredients on brew day.wow,after I opened that first one,that citrusy aroma is what I crave in all my ipa brews.i even made a hop pillow w/citra,my wife loves it too. EXCELLENT!!! I purchased this kit back when it was a discount kit so it included dry yeast. It was only the 5th batch of beer I had ever brewed and on a whim decided to submit it to a local competition just to get some good feedback. I ended up getting third place in the pale ale category out of 34 entries in that category. WOW. I have since made this kit at least 1/2 dozen times and love it every time. A MUST BUY! Loved this brew. I used the California V yeast and turned out beautiful. Everything I wanted with a pale ale. Cheers! 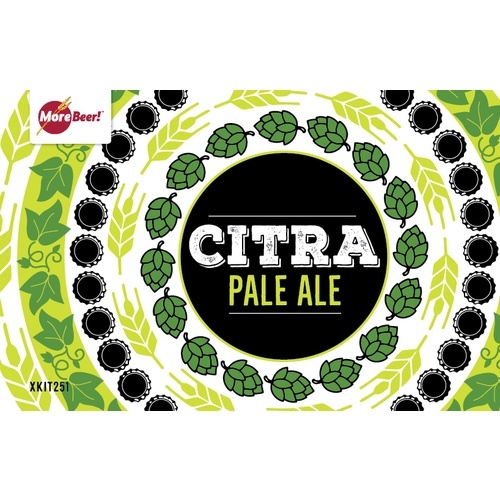 This kit has plenty of great Citra hop flavor and aroma. It is not overly bitter, but has that refreshing sourness that is perfect for a hot day. He was so happy with this beer. The only reason he didn't buy it again was because it had sold out for awhile, and he decided to try some other styles. Super hoppy means he's super happy. I really liked this batch. So much so, I ended up buying 2 lbs of Citra hops in orig HopUnion package from a guy on HomeBrewTalk, and I just brewed the all grain equivalent. I'm no longer allowed to eat/drink grapefruit due to cholesterol drugs, but now I've found something even better. I purchased this kit about two years ago when it first came out and it was about $25 with dry yeast and every person that had it absolutely loved it. I went back and tried to order it again and it was sold out for a couple months. When it was available again I order two more and everyone I serve it to was hooked. It has a grapefruit flavor, not overpowering just smooth relaxing summer beer. I keg my beer and with this one I keg conditioned it and let it sit for about 3-4 weeks at 68 degrees. This beer really benefits from a little aging, although I have to lie to everyone and tell them I don't have any or else they want me to force carb and pour it that weekend and its still really good. Crisp and refreshing. Great citrus hop aroma and tartness, but not lingering like some hop varieties (Northern Brewer). An instant favorite. I have brewed it twice, and it will be in brewing rotation again for summer enjoyment. I typically brew one extract batch for every 10 all grain batches and going forward this kit will most definitely be in my rotation. Great flavors, beautiful hop aroma. Everyone loved this beer, even my friends who prefer lighter bland styles. Never dry hopped a beer before. The extra worked was worth it. The price of the kits are steering me towards brewing all grain and buying in bulk. This has been my favorite kit I have brewed. I will have one of these on tap 24/7 while the others rotate. This beer turned out really good. Several of my friends who like a fair amount of hops in their beer really enjoy this. I can tell because they keep stealing it from my fridge! For me, it is a tad too hoppy. I might skip the dry hop step or at least use fewer hops for the dry hopping. Nonetheless, this is a very good beer. I like it, but it is just different as far as the hop profile. A very sessionable ale, I will say that. This is the best kit I have made and the first one that was really ready to drink after only 2 weeks in the bottle. Having said that, like the other reviews say, the 60% mark up on this kit seem a bit much. Simple, balanced, tasty. It is what it says, and has a distinct hop flavor (grapefruit or lemon zest), but it is very drinkable. A fantastic beer for summer. was a 11 beers under 50 cent! what happened? to good to true! what about doing a deal of the day with it? if so please email me that day. This has to be my favorite beer so far. The Citra hops are about as tastey as I've ever used, and my 'hop head' friends were amazed at the flavor. Crisp, refreshing, nice body and the aroma is fantastic! You gotta try this one, even if you're like me and not a huge fan of hoppy beers. This one rocks! My only complaint is the current price. As soon as this got popular, the price almost doubled! This one started out on the "beers for under $.50" list. Come'on Man! Give a Brew-Brother a break! I agree. It used to be 24.99. I have the recipe and it is so much cheaper now just to buy the ingredients instead of this kit. 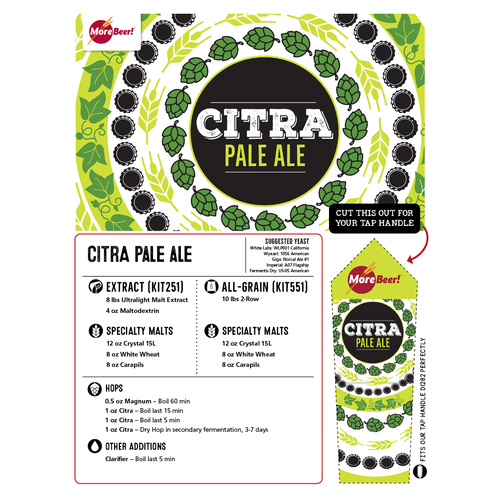 Great way to make Citra Pale Ale...tasty and easy to make.